I came across your book about 10 years ago and was particularly taken with your customer approach, most likely because it reminded me of my childhood. My parents owned and operated a small variety store and our family lived in the same building as the business. Our customers were essentially a part of our family. For me, part of the appeal to work for Fulton was the fact that Fulton is a family owned business, of which Bram Palm is the owner/President. Your book helped guide us to treat our customers like family. When customers come to visit us here in Pulaski, our goal is to make them feel welcome and part of our family. We have them stay in a company owned house – not a motel. The house is stocked with their favorite beer or wine and several homemade items (cheesecake). When at our factory, we always have breakfast or lunch for them and give them small gifts when they leave. We usually arrange for them to do something fun.. such as fish for salmon in the Salmon River, snowmobile or go 4-wheeling. We send them home with a 5x7 framed picture, that we take of them while here to remember their visit. The frame is etched with “Fulton” on it. Birthday gifts – As noted in your book, we are aware of our customer’s birthdays, but we have tried to go one step further. We have purchased large birthday candles that can be burned every year on the birthday up to 21 years of age. We send these candles to our customers when they have a birth in their family. The gift is unique and hopefully the customer will think of us for the next 21 years when their loved one burns the candle. We use our company website to acknowledge unique and special occasions in our customer’s lives and will document these occasions for display on our website. We try to stay in tune with the unfortunate events that may occur in our customer’s lives, as well and lend a helping hand whenever possible. We have dispatched employees to work and assist our representatives continue their business while they are in the hospital or dealing with the loss of a loved one. Family is there in the good times and the bad times, and if you treat your customers like your family, I think that’s the best hug of all. Looking forward to reading the new book. All the best, and thank you again. I've just finished reading your book and I simply LOVED it! You're not the only one who's dreaming of a hugging world. I've got a little story to share. I'm starting a home-bread-delivery business in a little neighbourhood. During a small street party organised by my neighbours , I went outside with my dad. Each of us had two plates filled with fresh out of the oven bread and pastries. Plus, I was dressed like a baker ( our delivery boys' uniform). People loved the bread, the business idea and the gesture. For about 50$, I got about 15 new clients. I know it's a beginner-hugger idea, but don't worry, I'll get to the world-class hugging crew with you guys one day ;). Thank you again for the great book and for spreading hugs throughout the world! Phill from Flight Centre Windsor would do anything to help ensure his clients had the best holiday possible, including offering a personal cat-sitter service. Phill’s clients were a couple in need of a well-deserved holiday. It had been over two years since they had been away together and work was getting the best of them. “They were really lovely, so polite and kind, and very mellow. They were looking for a two week complete ‘flop and drop’ somewhere beautiful to celebrate two significant milestones; a wedding anniversary and a birthday,” said Phill. After exploring their needs, Phill found a perfect fit with Virgin Airways flights to Cancun and a two week all inclusive stay at the Excellence Riviera in the Riviera Maya, complete with MyTime benefits. A few days later, Phill received a call from his clients to say they wanted to cancel their holiday. “I couldn’t believe they were going to cancel after how excited they were so I just had to find out why." As it turns out it, Phill’s clients had a much loved cat named Joshua and their usual cat-sitters had loved looking after Joshua so much that they went and got one themselves, leaving no room for a second cat. “Having had cats in my life (and dogs) I know what it can be like trying to find ‘the right place’ for your beloved pets, and so without thinking really I asked them if they would let me look after their cat while they were away." A trial weekend was organised and if all went smoothly they were happy to finalise and book the trip. “To sum it up, the cat (and I of course) had a brilliant time; we hung out, cuddled, and chased inanimate stuff around the house for two days solid. I was as tired as the cat by the end of it, but had a truly wicked time getting the best of both worlds, hanging out for a few days but then returning him back to his owners,” said Phill. Phill’s clients were happy and it was all systems go for their impending holiday. After getting to know his clients on a more personal level, Phill soon uncovered that both were members of the Metropolitan Police in Westminster; one working for the top level Tactical Negotiations team in places all over the world (primarily Somalia currently), and the other working for the Serious Crimes division. “We’ve had a number of job cuts here in the UK so for the best part of two years my clients have been solidly working to ensure their job security. “I have to commend them because both divisions are out there saving peoples’ lives every day but essentially they never get mentioned or recognised. I’m an analyst for a sales team of about 25 years. We work for a well-known financial institution. Our sales manager bought all of us Hug Your Customers. I’m currently reading it during my commute and am enjoying it. On the train, I tend to lean against a wall to let others sit and so I’m not moving around to accommodate other passengers entering and exiting the train. This morning, as I was reading the book, a man boarded with 2 large pieces of rolling luggage. The train was crowded, and he certainly wasn’t going to find anywhere to sit, let alone a convenient place for the luggage. Seeing this, I offered him my convenient spot against the wall so his luggage would be stable, and so other passengers wouldn’t have to avoid the luggage while trying to enter or exit. After switching, I thought, “I just hugged a complete stranger.” Felt pretty good. The book didn’t make me switch with the man, but it did sort of put it in perspective. I currently work as a retail Manager for a company called Pandora. Our brand ethos is ‘unforgettable moments’ something that can be reflected through each charm that brought meaning that each item tells a unique story for every individual. Over the last 9 months I have throughly enjoyed inputing the ‘hug your customer’ concept. It has changed the way we work in the store and has created confidence in the youngest of my team members. We have now created a hugging environment and every day we have a story to share. However, there is one story i would like to tell you about today. My Assistant Manager Nicola has been truly amazing with her hugs so below is a short story: Mrs Lewis came into the store and wanted to purchase a charm that reminded her of her mother who had recently passed away. She was served by Nicola and throughout the sale Mrs Lewis became very emotional and upset- which is completely understandable given the emotional story behind her charm. Nicola empathized with the customer and offered Mrs Lewis a hot drink and some tissues to try and make her feel comfortable and then continued to try and find something perfect which would help the customer remind her of her mother. Nicola was so touched by this story, that she sent Mrs Lewis a hand made card telling her how touched she was, and that it was a pleasure to meet her. Unexpectedly, 4 days later, Mrs Lewis returned to store with her husband, and a friend who she had recommended to come in as the staff were so helpful and friendly. She also enquired where Nicola was, but unfortunately, it was her day off and Mrs Lewis was told that Nicola would be in the store again on Monday. The friend that came into the store with Mrs Lewis bought a gold bracelet and safety chain. On Monday (01.08.11) Mrs Lewis re-visited the store again to see Nicola, and this time brought with her flowers and a card as a small token of thanks for Nicola’s compassion and kindness. While our store has received customer ‘hug backs’ before, this is one that has particularly touched the whole team, especially Nicola and myself. The words that Mrs Lewis wrote in her card were as follows …….. ‘Last Wednesday I came into your store to purchase a charm for a particularly sensitive reason. I was served by Nicola who was lovely and was able to locate quickly and without any fuss exactly what I requested. Then on Friday, I received a really touching card, personally from Nicola, which was so unexpected and compassionate (made me cry for all the right reasons). Because I was so pleased with my purchase and the service, which was beyond any that I would have expected, I recommended your store to a good friend who then purchased a gold bracelet and safety chain yesterday. So i just wanted to drop a line to say what lovely and helpful staff you have and a big thank you to your team, especially Nicola who I hope will enjoy the flowers brought in as a small token of thanks. Gillian Lewis. Big thank you to Mitchells for your inspiring book. I just wanted to send a quick comment regarding your book. When I was first hired by Mr. John-Claude Hallak, your book was one of my first ‘assignments’. I believe I read it in about two days. Two and a half years later, it is still on my desk and I am actually taking it with me on my vacation later this week to read again. I really enjoyed the book and am sure I will love it the second time around. Best wishes always! I had to pick a book for my sales class book report, and when I went to the school library we had a decent selection of books, but the title of this book really stood out to me. Even though it was a longer book I decided to get it. After I finished the book, I was really glad I read it because it even though I am only a sophomore in high school, I feel like I want to go into a business where I can hug customers. Your book has inspired me and I just wanted to say thanks! Dear Jack. I´m half German, half Colombian, and lived in Ecuador for 20 years. I bought your book, spanish version, in 2006. I read it and since i was beginning my company, FOLIGRIN, that produces and sells directly biostimulants to the flower industry in Ecuador, it was interesting as a guide for public relations(or that was what i thought) Huge mistake!!!!. Since the industry is small, about 300 farms, i thought that the sales came alone, since using our products bring nice returns. Other mistake. I hired a marketing specialist, who gave me good advice and it helped. But i thought about it many sleepless nights: There has to be a book where i can find easy ways to develop a good relationship with my customers. Thanks God i remembered your book. I said to myself: My products are a luxury and Mitchells sells it. Lets read it again. Let me tell you. I read it again in 6 hours. Every page was a complete class of management. There is an answer for all my doubts about how to handle opportunities or troubles. A perfect trouble shooting guide for small business. (And also large ones..). At some moment i felt like Rita Roman, as you tell that she said in some moment: “Now I UNDERSTAND”. The last pages took tears from my eyes. I share that dream of having a world where you get an outstanding service everywhere. So i want to hug back in some ways. 1. Please feel free to give my data to anyone who travels to Ecuador. I can help them with some guidance( business,tourism,restaurants attorney ,health issues etc). 2. If you have an Ecuadorian associate that travels to Ecuador, please let me send along with him some pounds of a special mixture of coffee that a local coffee shop roasts and blends for me. I prepare it for my customers at their offices and the hug of all who get the smell of it. Some of them receive a pound of it regularly and it works as a huge hug. 3. I am organizing the Coffee Class, where i invite 5 or 6 customers and they get a 2 hour class about Coffee, taught by the coffee shop owner, an international expert. They love it. There are more hugs to share with you and soon you will get them. I worked in a bookstore for two years, and your book “Hug Your Customers” was one of the best books that I have read. While working there I had the opportunity to read a lot of books. But when I read yours, I could see the difference. All of the bookstores do the same thing: Take the book and give it to the client or order one when they don’t have it. But I saw that it’s possible do the difference with small things. What do I do? He really needed the book. So, I decided to ask for a home delivery for him. It wasn’t expensive and I was sure that the bookstore could pay for it. Well, they didn’t pay, but I paid. And it was the right thing, because this client recommended our bookstore, more than this, recommended me. Now, the bookstore has a home delivery, and the client doesn't pay for it. Thanks Jack, hugs for you! My name is Luis Vasquez. I´m peruvian and I arrived to Montreal, with my wife and my little daughter Camila, on April 30th, 2010, to struggle hard to get on in life. We came to Canada to fight step by step by our dreams. We are permanent residents in Canada. The curious was that I brought from Peru your book “Hug your Customers”. I bought it because I´m interesting in knowing how to improve relationship with customers. For me, it´s a fascinating subject. I finished to read it here and after that I improved in many things I do. We´re making our own story in Canada. My last grand hug was yesterday night, when my neighbor was very ill. He had a high fever and I went immediately to his apartment, with some basic medicines for him. After 20 minutes talking with him, I returned to my apartment and slept thinking about that. In the morning, I called him for ask about his health, and he told me: “Thank you very much. Yesterday, I was so bad and you helped me immediately after my call. I am happy you are my friend.” In that moment, I remembered one of your Top 10 Reasons to Hug: “You get a hug back”. It was wonderful for me, because I gave a hug and I got a big hug back, I think. We are not clients of “Mitchells/Richards/Marshs” yet, because I´m not working in this moment, but after I started to work, I´ll visit your store. I admire philosophy of your business, that it´is too, a philosophy of life. Now I´m interesting in read your book “Hug your people”, and my wife started to read “Hug your Customers”. In your web site, I read you will be in Toronto next september 24. Your book has motivated to me, so, I´m very grateful to you for your advices. It´s a real guide for improve our attitude in life, too. I hope to know you some day. It would be an enormous hug in my life. I want to thank you for your inspiring talk this past Monday, April 26, 2010 for the associates of the Adam Broderick Salon & Spa. I had already read your book, and am even more motivated to hug my customers! I am also looking forward to visiting Mitchell’s for the first time! I just wanted to check in and say I’m so glad I purchased Jacks books. I have been able to bless so many people with Hug Your Customer and Hug Your People. The idea of hugging is global and I don’t know how people cannot hug. If you have a business and your are not hugging, your business is probably suffering and not flourishing. Put your heart in your business and your business in your heart. (someone else said that.. not me.. but it’s powerful). I thank you for being a hugger and sharing this message with the world. I worked for Mitchells November 1998 through beginning of August 1999 before my husband was given a promotion and was asked to move to Scottsdale, AZ. I left Mitchells with a heavy heart. It was the best working environment I had ever experienced and I really miss Todd and Bill and Jack very much. Working for them was like having an extra family. I just remember Jack, Bill and Todd always wanting to know how everything was and thanking me for my assistance, even though I always loved what I did. Using the camera to take pictures of customers purchases so that they would remember what tie to wear with what shirt and jacket or suit was very exciting for me. I miss you all very much and think of you quite often. What a wonderful book! My boss, Vern Nelson, shared his copy – I couldn’t put it down. When I finished, I wrote Vern a handwritten note and enclosed a Starbuck’s gift card. (He stopped every morning on his way to work for his coffee). There are 2 hugs in this story – one for the author and one for a boss who cared enough about his employee to share such valuable insights. Thank you! Please let Jack know his writing motivated me to go back to my “go getter and make things better” mentality at work… because I had thought something awful over the weekend. I thought, “Ok- it’s a job. My fault for thinking it was more than that.” I think had it not been for HUG YOUR PEOPLE I would have spent the rest of my life feeling terrible. There is just so much love in that book – it jumped right out to my heart as well and everything he said pulled me back up time and time again. Jack understands …wonderful feeling that is. I can count on this family to keep the rest of us feeling wonderful. I started thinking about Jack Mitchell’s talk this morning so I wanted to express myself to everyone. I feel so blessed working here at Mario’s. Besides loving my job and what I do, I love everyone at Mario’s. This company is like a second family to me. Everyone from the office, the managers, the buyers, the buyer’s assistants, the sales people, the customer service people, the tailors, and the warehouse are very special. I feel so blessed having each and every one of you in my life. Sometimes, people don’t always show appreciation like they should, but I want everyone to know that I greatly appreciate each and every one of you. Although I work in the office, I feel like I know just about everyone from calling people so much on the phone. Even those I don’t work closely with, I feel a certain bond with. We are very fortunate to have so many caring and compassionate people here that I just want everyone to know that I never take it for granted at how lucky I am to have so many people that care. My dad Herb Wurtzel, a long time customer of your Westport store, was 88 today and I gave him your book at lunch time. He now lives full time in Florida. By this evening he had read half the book. He loves it. I gave him: "Hug your Customers". I saw High Net Worth the other day and that is where I heard about your book. I remember when he lived in Stratford, Ct. and I would go with my dad to your store what a wonderful experience it was. I want to thank you for the very warm reception that your team in Greenwich, (Samuel Anderson & Pamela Miles), extended to my sweetheart (Robyne) while she was browsing around in Greenwich looking for Hug Your People & Hug Your Customers! What a shock it was for Robyne, to be warmly received in the shop, as if she was a well heeled native of the community, and then to have you and other officers interrupt your meeting up stairs to greet a customer and introduce yourselves to her. What an experience this was for her! This speaks very loudly and you all, do, talk the talk & walk the walk. Your actions were sincere, spontaneous and very natural. Robyne thought that she was back in Atlanta and not in New England. We are on a similar voyage here in Atlanta with our Hotel vs. the competitive set. We are on our Drive for Five, (Mobil Five Stars & AAA Five Diamond). We know and agree with you that this has to be achieved by the consistent, creative, anticipatory service that all of our Colleagues & Staff Members are able to deliver to every guest entering our world of Hospitality. I especially appreciate the kind words you wrote on the inside of the book, "Hug Your People" that Robyne gave me. I look forward to completing both books and how we will be able to implement these aspects of better service in our environment. We hope to create another legacy similar to what you and your Family have accomplished. No wonder why Mitchells / Richards & Marshs is such a success! The tales are too numerous to relate. 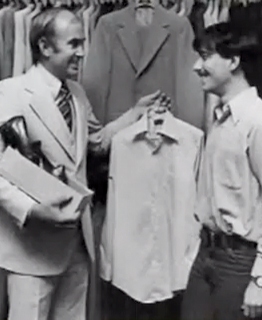 Having many years in Menswear clothing experience, at 16 I became a Menswear Clothing fitter. Chalking clothes at that early age, the opportunity to handle an RFA with a immediate deadline materialized quickly. I took on the role (no cape or phone booth necessary) I took on nome de tailoring, ETT, Emergency Tailoring Technician. Home and business offices became the site of “tailoring CPR”. Pick up and delivery was included ; a “Free Parting Gift” necktie or shirt included to suit the clients lifestyle and taste. 100 mile roundtrips were common. Running to British Airways to resolve a problem, included. Morale of ETT: resolved problems, instilled shop loyalty and resolve in clients. A wise man once said, “Get involved in the process and the results will take care of themselves. I had the very best hug the other day from My Uncle Jack, who lives in Florida and was traveling to Texas to hear your speech, called me at Mitchells when he saw my name in your Hug Your Customers book. He was so excited about your book and couldn't wait to hear you speak. Very soon thereafter – you and Pamela had invited me to hear you speak at the Jewish Home in Fairfield. Your speech about Hug Your People was truly inspiring! You are a wonderful speaker. As I was looking around the room and watching your captive audiences faces -you absolutely kept everyone enthralled including me! I am very proud to be a part of the Mitchells team! Thank you for all that you do. I am very much enjoying your latest book and can’t wait for the next. Just wanted to send you a quick e-mail to say thank you! You are an inspiring man and I speak for my entire team here at Commerce Bank when I tell you that you have captured the hearts of more Fans yesterday with your presentation at the Fairfield Business Council breakfast! I can relate to the passion that drives your energy and enthusiasm with your People, Customers and your presentations. I have worked for Commerce Bank approaching 20 years this October. It is truly rewarding to create Customers that are Fans for life….and People that truly want to be on your team. With technology today–sometimes you lose that added touch of a hand written note– which truly makes the difference and creates a different emotion that e-mail can not always capture. Effective today– my birthday and anniversary wishes will now be sent in ink. I look forward to the day our path meets again–and I thank you for making a difference for me personally yesterday! Hope your trip to Ireland exceeded your expectations! I just read your Hug Your Customers Book and it incented me to purchase your Hug Your Employees book. They are going to provide great help and guidance as I take over a customer focused division of a company next week. Thank you for sharing your insights. Your stories about Mitchells have made me grow even more fonder of your store. You have a great business, with great product and great employees. I love your store and long for the day when I can go into the Hermes shop and Ralph Lauren shop and buy whatever I want. I know that day will occur soon, but in the meantime, I could really use your help migrating my Macys, Brooks Brothers & Lord & Taylor wardrobe into the Mitchells, Richards and Marshs wardrobe I long for. It was nice of you to send me your book, which I promptly put in the cabinet next to my bed with other priority books, and then proceeded to forget. I finally poked around in that cabinet and found the book and read it. It was a delightful read and I enjoyed your basic principles and the many colorful anecdotes. You’ve built a great business, company, and work culture. Thank you for sharing it with me. I agree entirely with what you are saying, so it is not a coincidence that our formal company values here at Digital Chocolate will sound familiar to you: they spell out EIEIO and stand for Excellence, Integrity, Energy (eg passion), Innovation (eg creativity), and Ownership (including teamwork). The team thought it was amusing to spell out the sounds from the Old McDonald’s tune. Huge hug back for writing this book!!! I love it! I did not put it down once I purchased it at Barnes & Noble stayed up until I finished it at 3 am. FYI – I just started to assist the billing dept. with customer collections and even though I’m a people person living up to the meaning of the my name derivation from Alexandra – helper and defender of mankind your book really helped to reiterate what this high tech world has forgotten – the human touch– the hug that always gets good responses from being human first and second because their close to our hearts as we care for them because they’re our customers. I am very impressed with the data that you have on your customers and how you just love to hug em. I think that personalizing a family like business will make this world a better place. Thanks again – God bless you!! Wishing you tremendous more success!!! Another Hug- we were expecting an important produce delivery Sat am this did not arrive our chef telephoned the representative, who then found the order on his spread sheet and personally went to purchased all the produce we had ordered out of his own pocket and personally delivered it himself – this was his day off - he made it happen and he was hugging us. Then he found out why. But we were hugged and happy. I just wanted to take the time to share with you how we have spread the hugging culture through out our organization, Samsonite. Since Jack’s presentation in October all members have embraced the culture with a commitment to continue to exceed our customer’s expectations. On my most recent trip to Asia, I introduced “Hug Your Customers”. During the sales training workshops, the team was educating me on how to say “Hug Your Customers” in various languages such as Mandarin, Cantonese, and Japanese. The word ‘BOA’ means hug in one dialect of Chinese. At the end of the trip, the team had given me a beautiful book of Hong Kong each signing the front page. It was so amazing to see “Hug Your Customers” written in so many different languages and leaving Asia with their new catch phrase! Just a small insight of how even though your culture has started with us in the U.S., it can be globally applied. Looking forward to “Hug Your People”! A few weeks ago, one of our tellers, Willis Williams, noticed a customer’s choice of music at our drive thru window. He struck up a conversation with her about it, and found out that she loves Dean Martin. He also found out that her birthday is February 8th. It turns out that Will has a rarely recorded concert of Dean Martin from February 8, 1964, and he decided to make a copy for Ann. He gave it to her daughter this week to give to her, since he hadn’t seen her recently. Ann called today, and was completely beside herself that Will thought of her in such a personal way. She wanted to know when he needed the CD back, and when he told her it was hers to keep, she was amazed. This is a perfect example of how we can touch our customer’s lives when we just take a minute to listen and show interest. Will definitely knows how to HUG our customers! I just finished your book and it was one of my favorite business reads in a while. I received the book from my relationship manager at American Express. What a great gift. I enjoyed the book so much and felt that it reflects such a huge part of the culture we have in our company that I am going to select it as our company book club choice for next quarter. We are an event service company that has grown from $500,000 in 2004 to topping $10 million projected for 08. This growth is attributed to the way we hug our customers in ways that others in this industry have not figured out yet. Our culture is everything. I may just come from Chicago to shop your stores just to experience it. I will let you know the comments from our book club next quarter. Congratulations on such great success! I just finished reading your book & thoroughly enjoyed every page, every story and every tip! In my early 20′s, I had the privilege of working for a hotel chain in Iowa that was HUGE into customer service. It really stuck with me all these years. I am in the process of starting my own business… a car shop that caters to women. I am really excited to share the principles that were outlined in your book. Thanks for the inspiration! I am reading your book right now and you did an awesome job. You have been able to put words on our everyday experiment and you have helped me improve a lot my sales techniques. In fact my brother Joy bought the book and lend it to me. We live in the Indian Ocean in a small island called Mauritius. If you come here let me know I’ll come to hug you. Thank you for sharing such private moment of your life with us.